One Mom's Moxie: Chick Flick Flash Giveaway! It is almost Valentines Day which makes us all think of love, relationships & chick flicks! Today Pinching Pennies with Heather and some other great blogs will be having a flash giveaways for an awesome chick flick movie! 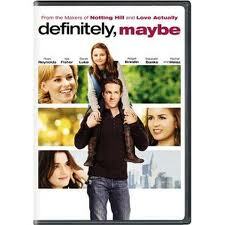 Today from 5pm to 11pm CST you can enter to win 'Definitely, Maybe'. Enter on the Rafflecopter below! Good Luck!